IT pros debate new Green Grid carbon emission metric. Next up? Water. Two new data center metrics from The Green Grid may help data centers track their carbon emissions and water use and compare and contrast their results. The Green Grid, which made its first splash with its simple Power Usage Effectiveness (PUE) metric for determining the efficiency of a data center’s facility equipment, followed up last week with new Carbon Usage Effectiveness (CUE) and Water Usage Effectiveness (WUE) metrics. Another data center manager from frigid Fargo, N.D., said it’s hard to talk about global warming with two feet of snow on the ground. “This is America and we don’t care about carbon emissions,” he joked, while acknowledging that his company’s energy mix is mainly coal-fire based. Despite lackluster interest from many in the IT community, Christian Belady, Green Grid board member and an IT architect with Microsoft, said most large organizations in the Global 1000 already report carbon emissions in the European Union, and the EPA is interested in the CUE metric as well. Calculating CUE is pretty easy, once you have your PUE number and a Carbon Emissions Factor (CEF). CUE = CEF x PUE. 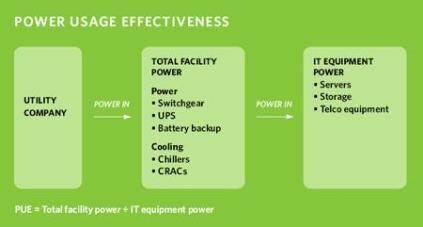 PUE is calculated by dividing the amount of power entering a data center by the power used to run the computer infrastructure within it. PUE is therefore expressed as a ratio, with overall efficiency improving as the quotient decreases toward 1. An average PUE, where the data center cooling and backup power are eating up as much or more power than the servers, may be between 2 and 2.5. To find your Carbon Emissions Factor (CEF), Belady recommends checking in with the U.S. Energy Information Administration's tools for voluntary carbon reporting analysis, which can provide a CEF by region. The carbon emission factors vary dramatically based on the utility mix in each area. For example, the highest CEF went to the Rocky Mountain Region (CO, UT, NV, WY, MT), with a CEF of .909, and the lowest CEF was in the Columbia River corridor (OR, WA, ID), with a .147 CEF. A data center in Oregon with a 1.5 PUE has a CUE of around .220, whereas a Nevada data center operating at 2.5 PUE may have CUE around 2.27. The closer you get to zero the better. Belady admits that the data center industry hasn’t worked out all the bugs with CUE, but said that it was important to publish something and let people start kicking the tires. Detail on WUE are less fleshed out, but there is a consensus in the data center industry that water will be a scarce resource in the future. Since companies already measure water consumption, the new metric should not be hard to use. The equation will likely look like this: WUE = Total water used by the facility divided by IT load. Companies can choose specific equipment to improve their WUE. For example, using untreated outside air to cool servers instead of chillers or using gray water for cooling gear. What did you think of this feature? Write to SearchDataCenter.com's Matt Snsberry about your data center concerns at mstansberry@techtarget.com.